Lu was invited to a photography event in the heavily controlled region of Xinjiang. He flew to Urumqi, the region’s capital, on Oct. 23. 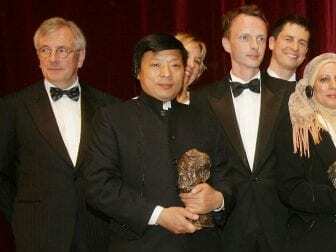 Lu Guang holding his Henri Nannen Award in 2008 in Hamburg, Germany. National security officers took the photojournalist away, she wrote, saying she heard the news from the wife of the person who invited Guang to the event. Lu, one of China’s most well-known photojournalists, has been active since the 1980s. His award-winning photos shine a light on problems the Chinese government would prefer to keep in the dark, such as intense pollution and AIDS. He was born in 1961 in Zhejiang province. His first time holding a camera was as a factory worker in his hometown. Lu has won a barrage of international awards, including the Henri Nannen Prize in Photography and several World Press Photo awards. He won the W. Eugene Smith Memorial Fund in 2009 and a National Geographic Photography Grant in 2010. He was invited by the U.S. State Department to become a visiting scholar in 2005, becoming the first photographer from China to do so, according to the World Press Photo Foundation. “Lu won the [Visa Pour l’Image festival] contest outright in 2004 for his portraits of “Aids villages” in China’s central Henan Province. Until then, Chinese photographers had only ever received World Press Photo awards in the arts and sports categories — never for reports on social issues. Lu has always worked as a freelancer, according to the Times.